Oh wow... Pam's pottery lady went all out for us! This awesome 'pudgy mug' measures almost 6 inches wide - with the handle, the cup itself is 4-inches 'fat' and a little over 4-inches high, and is very heavy. 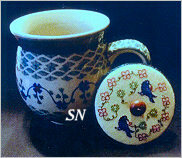 It is a piece of hand-painted Polish Pottery. 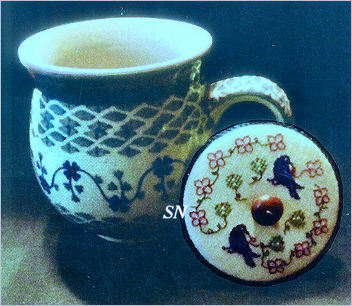 Pam has designed some cross stitch for the cup lid... and added a little wooden handle! 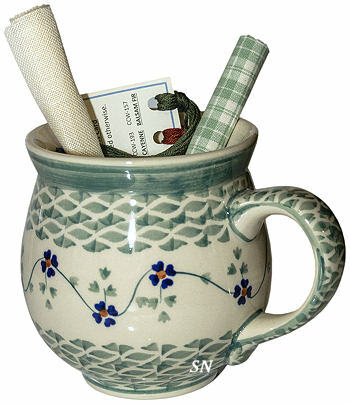 Tiny blue flowers to match the pottery artwork, these VERY LIMITED kits include the chart, 32ct linen, hand-dyed Classic Colorworks flosses, backing fabric and round finishing boards for the lid and the little finished wood knob handle. Best part is that you get to enjoy the mug before your stitching is finished... and since the lid lifts off... you can actually use this for soup or coffee, wash it, and trim it with your needlework in between using it! Pam Reed has several cute smalls... everything is presented in kit format and includes the frame, box or jar! 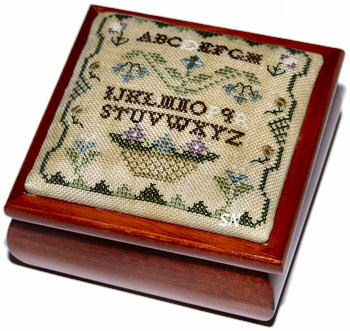 Sea Flowers & a Tiny Box -- A very traditional sampler border, alphabet and flower basket, the 4 x 4 x 2 hinged box is included in the kit. Stitched on 32ct with Weeks hand-dyed flosses all pre-tied on to a thread card, your stitching mounts onto the padded top of the box. There is also a bonus fob design in here, along with lovely box lining fabric! 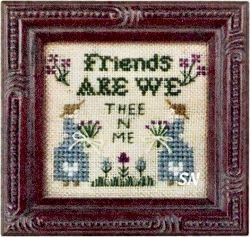 Friends Are We -- An itty-bitty piece, this is presented as a complete kit of 32ct linen, flosses, chart, needle and the 3 x 3 mini easel-backed frame! 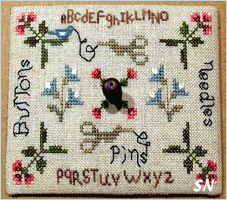 Your stitching is minimal -- there is a little over-one stitching, but since the whole thing is only 2 x 2... you can DO IT! Spirit of America -- Cute little 2 x 2-1/2 inch, 6-sided jar -- you're stitching a small cushion to hang from the felt ball on top of the jar. Almost nothing to this, it's just a quickie! Pam Reed is releasing her first two box toppers -- Shades of Autumn and Runaway Buttons, Needles & Pins (the Spring version) in this 4-part set. Finishing approx 7 x 8, each topper design is included in the kit along with linen, flosses, charms, lid lining and finishing instructions along with a hand-finished wooden knob you can see in the centers. You can finish the tops HOWEVER you like (skipping the box idea if you want.) Wander the big box store for a neat box bottom! 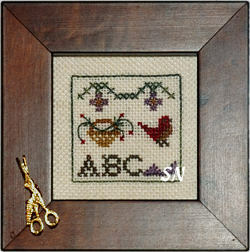 Autumn features pumpkins and fall shades... Spring features flowers and little stork scissors! Winter Topper will release in November of 2017, Summer Topper will release in March of 2018. 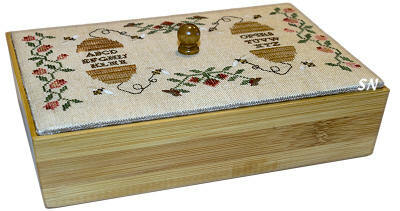 The Bee Keepers Needlework Box - A Box to store your Beeswax Waxers! This is a smoothly finished 6 x 9 x 2 honey-colored stained wooden box with a stitched lid. Choose a neutral cream or lightly yellowed or tanned 32ct linen for the Satin-stitched beehives and floral vine decorating the top. Everything is charted for DMC, Weeks and Gentle Art flosses. After your stitching is finished, you are wrapping the provided board with your needlework and attaching the little wooden knob handle. 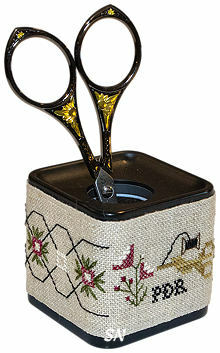 On the underside of the lid, you are lining the lid with gingham fabric, and buttoning down a band to hold threads and scissors. You get a really cool circular beeswax candle in a miniature wooden crate to store in here -- in case you don't have any threading waxers. 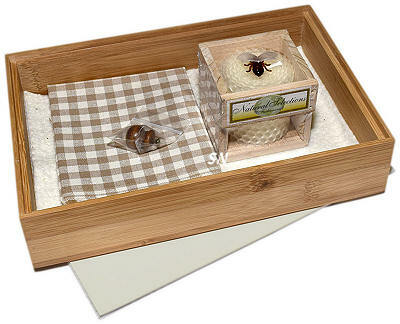 The box kit contains the box, lid board, gingham lining fabric, Warm and Natural batting, interfacing, the wooden knob, that darling candle, chart, and finishing instructions. What a fun and different project! If you've been collectiog the beeswax molded pieces, you need something to store them in besides plastic bags!!! This is kind of fun... just a plain ordinary plastic paper clip cube 2-1/4 inches in size... Pam has filled the inside with foam rubber. You can poke your scissors into the top opening, and they stick in here safe and sound!!! Because the plastic just isn't the coolest thing, you now get to cover your cube with needlework stitched on the provided 2-inch natural linen banding. Bamding features a woven edge, so NO extra FINISHING! A few Lazy Daisies and Smyrna Crosses with DMC floss make up the flowers all around and there is a pair of stork scissors stitched over one thread that decorates one side. Cute, functional and very quick, everything is in here. Cube, chart, linen, flosses and needle. All you add are scissors! This is the cutest little thing! A tiny kit for a tiny fob, this is stitched on 1-1/8 of an inch wide natural linen banding. Two little fish in teals, a row of golden hearts, there is a bit of gold cord in here for the hanger, a tiny brass heart, and the hand-dyed teal ball fringe to trim it when you sew it closed. Finished only 1 x 3 inches -- stuff it a little or not. 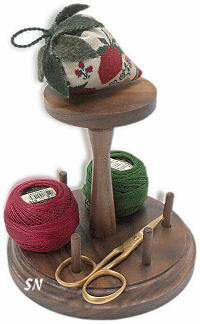 Kit includes the chart, linen, flosses, needle, charm, trim and cord. Oh this is really cute! 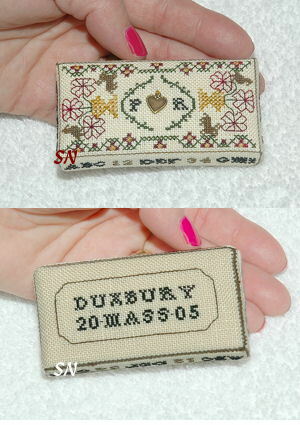 It is a miniature sampler stitched over one and two on 32ct Summer Khaki Belfast Linen. 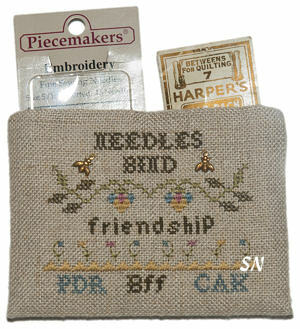 Presented as a complete kit, the threads included are Gentle Art Sampler Threads, Weeks and DMC. Packed with special stitches, there are Long Arm, Queen, Alternating Scotch, Elongated Cross, and Smyrnas all over, in the little bands. The entire thing finishes approx 2-1/2 x 5-1/2... you get the finishing fabric for backing and wooden dowel with spool decorated ends. Pam Reed has 4 new small projects that might make *just the perfect small gift* for just a small occasion! 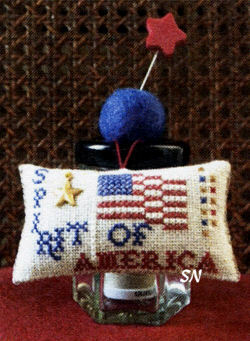 Extra-Tiny Basket Sampler -- An 18 x 18 Stitch Count mini-masterpiece! 5 Shades of hand-dyeds and 32ct linen, your Extra-Tiny fits into one of Olde Colonial's MINIATURE Birds Eye Maple easel backed frames that measures only 2-5/8 inches in size. The sampler opening is only 1-1/2 inches! Complete kit contains the chart, linen, flosses, needle, scissor charm and bitty frame. 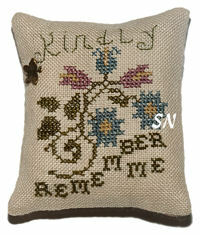 Kindly Remember Me -- A small floral bouquet embellished with a single brass butterfly charm, you'll need bits of floss from your stash to make this 2 x 3-ish cushion. Offered as the chart with linen cut and charm. Needles Bind -- This is a pocket to hold a couple of packages of needles. It has room for your initials and those of your BFF! Some Smyrnas and Queens in here, the kit comes with the 32ct Natural linen, flosses, muslin lining, needle, a pair of bitty bee charms and some assembly instructions for the 2-1/2 x 3-1/2 inch case. Quite the well-dressed tape measure! 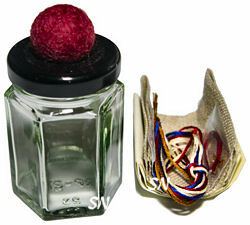 Olde Colonial has a new offering that is a companion to her Waste Knot Stitching Basket. This 60-inch retractable tape measure is covered with your stitching on 32ct Light Mocha Belfast linen in Gentle Art Sampler Threads. A pretty urn of flowers on one side, and smaller flower on the back, you stitch the side band, as well. Pam has good assembly instructions in with this -- 8 actual pics of the process... so it isn't scary! The pull is even a tiny wooden spool! Offered as the complete kit of chart, linens and threads, tape measure, paddings and templates -- just everything! Olde Colonial Designs has tiny designs in bitty kits... I don't think all of them are new... but I think I missed one of two of them before! Quite a charming collection, we have all of them on our Olde Colonial Pages. But first, check out these fun little Needlebook! Stitched on 32ct Light Mocha linen in greens, mauve, lavender and butterscotch flosses, the case features a needle page of green wool. A few special stitches in this, the whole thing finishes just a bit smaller than that darling wooden turtle! Complete kit contains the turtle palette, linen, flosses, bird charm, all the necessary instructions, interfacing, wool, ribbon, needle, floral lining fabric... you name it! These beautiful boxes have been made to fit Jeannette Douglas's series of Stitches Samplers. Handmade by Olde Colonial, the boxes are available in the Birdseye Maple -- a rich reddish brown finish, or a smoother, darker brown finish. Overall measurements are 9 x 11 x 3, with a top opening of approx 8-1/2 x 6-1/2 inches. 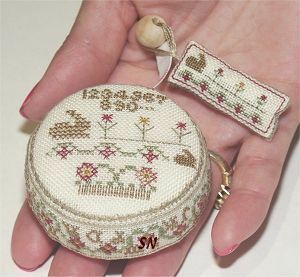 Just lovely, this box is the smaller version of the box featured in My Stitching Treasures. This is a darling miniature 'mattress' for your desk! It'd be cute tucked into a display of needlecases and such... or perched on a shelf beside a framed sampler... you can put it lots of places! Offered as a complete kit from Olde Colonial, it measures a mere 1-1/2 x 3 x 1/2 inches when assembled. 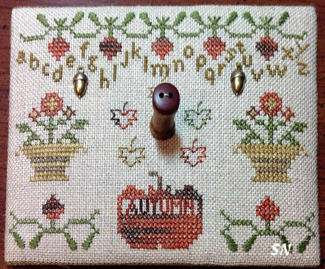 It features tiny sampler motifs on the top, the numerals and alphabet running along the edges, and a plain bottom area to personalize. Sporting pretty Currant, Grecian Gold, Forest Glade and Bark overdyeds, the complete kit contains the 32ct creme linen, the flosses, a tiny brass heart charm... all the necessary interfacings and stiffening inserts, complete assembly instructions and even tiny plastic pellets for the weight!!! Just something fun every stitcher really needs, because it's small and UNIQUE! 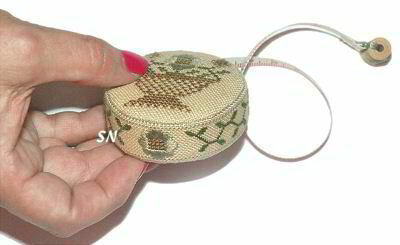 Quite the functional stitcher's gadget, this is an endearing stitching gadget -- a tape measure that is covered entirely in cross stitch!!! Your complete kit includes the retractable tape measure, linen, flosses, felt lining fabric, antiqued silver scissor charm, and wooden pull bead to stitch and assemble the most charming accessory your stitching tote has seen in some time! The picture shows it in my hand, so you can see the finished size... I just love it! The colors are soft taupes, raspberry, and moss green, it's stitched on 32ct creme linen... and truthfully, may be a challenge for some to finish. It's assembled entirely by hand... the instructions walk you through which pieces to assemble to which... and include actual sized templates for the felt interfacings. The tiny fob attached to the end of the measure is less than 1/2 x 1 inch... it's just enchanting! Available as the complete kit.